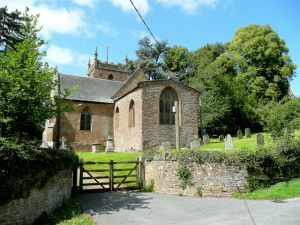 The 13th-century church of St Andrew and St Mary stands in a wooded location overlooking the River Wye, in the grounds of How Caple Court, a 17th-century house built by Sir William Gregory on the site of a medieval manor. The church boasts richly coloured stained glass windows. The earliest parts of the church date to around 1210, but it seems almost certain that it stands on the site of a much earlier building. The nave, chancel, and tower date to a rebuilding in 1693. The east window has glass panels depicting the crests of the three families who have owned How Caple Court since the 13th century; the Caples, Gregorys, and Lees. The nave roof was rebuilt during the late 17th-century restoration, though the chancel roof probably dates to a century earlier. A late 17th-century screen separates the nave and chancel, and from the screen hangs a royal coat of arms to William III. A local tradition says that the screen was carved by Grinling Gibbons. The font is 12th century, with an octagonal bowl carved with geometric patterns. Curiously, there are two pulpits, each with a sounding board. Look for several surviving medieval floor tiles, one depicting a huntsman blowing a horn, and another showing hunting dogs chasing a stag. The south transept is full of memorials to the Gregory family, including a wall tablet to William Gregory (d. 1765). Gregory was a successful barrister who served as an MP and rose to become Speaker of the House of Commons. He purchased How Caple Court from the last of the Caple family and was responsible for restoring the church and building the south transept. Not surprisingly the transept is known as the Gregory Chapel. The windows in the north wall of the nave hold glass commemorating members of the Lee family. Within the church is a Norman font and an unexpected treasure in the form of a 16th-century German diptych, now partially restored. The origins of the diptych are uncertain, and one source suggests it may date to the 14th century and been crafted in the Low Countries.